The Plott Hound is a medium to large dog originally bred to hunt big game, like bear or wild boar, but over time they came to be used more often to hunt raccoons. In fact, the Plott Hound is one of several coonhound breeds (some others are the Black and Tan Coonhound, Redbone Coonhound, and the Treeing Walker Coonhound). The Plott Hound is a scenthound—a type of dog bred to hunt using his incredible sense of smell. They have a melodious bay (in hunting terms, called “voice”). Plott Hound aficionados find that voice beautiful, but your neighbors might disagree. Plott Hounds love hunting, but can also make excellent family companions as long as you provide enough outlets for their abundant energy. Daily, vigorous exercise is a must to keep this breed happy and well mannered at home. Colors: Any shade of brindle (darker streaked or striped pattern on a lighter background), such as yellow, buckskin, tan, brown, chocolate, liver, orange, red, gray or blue. May also be solid black. May have a saddle pattern on the back or other markings. In the mid-1700s, a German immigrant named Johannes Plott immigrated from Germany to North Carolina and brought his five Hanover Hounds, an ancient breed descended from Bloodhounds. Plott hunted bears in the mountains with his dogs, and his Hanover Hounds bred with local dogs. These offspring came to be known as Plott’s Hounds (and later, simply Plott Hound). Today, the breed is part of the American Kennel Club Hound Group, where it is known simply as the Plott. It’s also recognized by the United Kennel Club as the Plott Hound, where it’s part of the Scenthound Group. It is the official state dog of North Carolina. The Plott Hound’s short, smooth coat requires minimal care. Weekly brushing with a soft bristle brush, rubber curry brush, or hound glove will remove loose hair, revealing a glossy shine. Plott Hounds can sometimes develop a bit of a doggie odor, but occasional baths will keep them smelling sweet. Lift the pendulous ears regularly to look inside. Normal ears are free of wax and debris, and are not red, inflamed, or bad smelling. Ask your vet to show you how to properly clean your Plott Hound's ears with special cleanser to prevent excess wax buildup. Inspect the nails regularly and trim as needed. 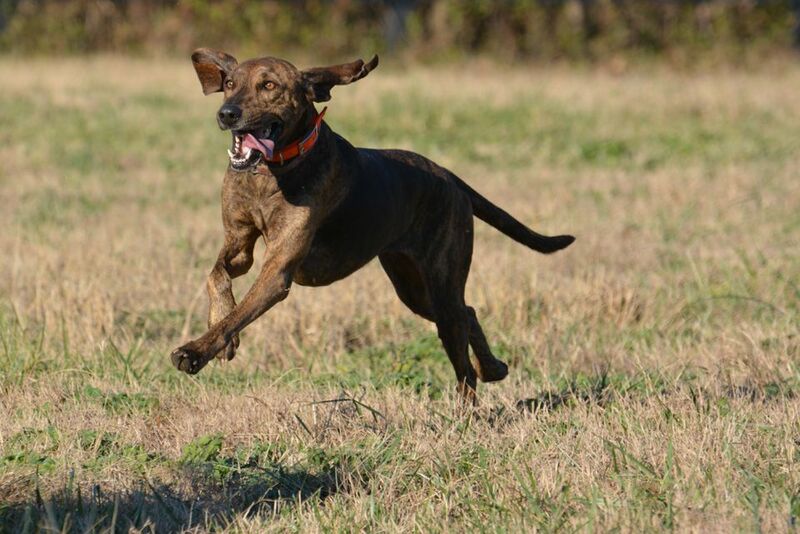 In order to do the job they were bred to do—hunting alongside their human companions—Plott Hounds have to be athletic and powerful. They are bred for endurance, which means that even Plott Hounds that don’t hunt need daily outlets to expend all their energy. Daily runs, long walks, or opportunities to run or play fetch in a safely fenced area are an absolute must for the Plott Hound. Never trust a Plott Hound off leash—they are too prone to following tempting scents with their nose or chasing small critters, and might run right into traffic or another dangerous situation. Always keep your Plott Hound on a leash when exploring outdoors. High energy levels combined with intelligence mean the Plott Hound needs mental stimulation. They are also big, powerful dogs, so start training at an early age. Plott Hounds are smart, but they can be stubborn, so training takes patience, creativity, and persistence. Short, frequent training sessions using reward-based positive reinforcement training will get the best results. Luckily, Plott Hounds are highly food motivated—tasty treats will go a long way toward encouraging a Plott Hound to do what you want. The Plott Hound is typically healthy, with few genetically linked health conditions. Like many large and giant breeds, they may be prone to hip dysplasia. Reputable breeders have their Plott Hounds' hips x-rayed prior to breeding so they don’t breed dogs with poor hips. Their medium-length ears can be prone to ear infections, so it’s important to keep them clean and dry. Schedule an appointment with your veterinarian if you notice any redness, a foul odor, or excessive wax and debris. If your Plott Hound spends a lot of time outdoors hunting or just playing, be sure to use a monthly flea and tick preventive, and inspect your dog for ticks after he’s been in grassy or wooded areas. The Plott Hound does best on a high-quality commercial dog food or complete and balanced, home-prepared diet. Like most hounds, Plott Hounds love to eat. It’s important to avoid overfeeding them or they will become overweight. Obesity is a major contributor to common canine health issues like hip dysplasia and diabetes. Feed your Plott Hound measured meals (using an actual measuring cup rather than a large plastic cup) at scheduled times (for instance, breakfast and dinner). Don’t free feed (leave food out all day). Ask your veterinarian to advise you on the proper amount of food to feed your Plott Hound daily to keep him at a lean and healthy weight. The actual amount might vary depending on the type and brand of food you choose to feed.